Nutzen Sie den Kreuzfahrtschiff-Halt in Messina, um die Küstenstadt Taormina und die Höhepunkte von Messina auf dieser 4-stündigen Tour zu erkunden. Besuchen Sie die sonnigen Strände oder bezaubernden Shopping-Straßen von Taormina, bevor Sie das antike griechische Theater bestaunen. Machen Sie halt an der Kathedrale von Messina und einem besonders atemberaubenden Aussichtspunkt über die Hafenstadt. Tauchen Sie auf dieser kombinierten Tour ein in zwei wunderschöne sizilianische Städte. Our guide met us at the pier and took us on an amazing tour of Messina and Taormina! Our guide was well versed and very comfortable with his knowledge of Sicily! He showed us the beauty of Taormina and we had amazing views of Mt Etna! We had a private tour for just the four of us and we loved every minute! At the end of the tour he dropped us off, at our request, at the best cannoli bakery on Sicily! Fortunately, it was just across the road from the port!! We marched onboard with four of the most delicious, fresh cannoli's ever!! Our guide was at the pier when we arrived. He was very friendly and courteous. His English was not as fluent as we had hoped so communicating was somewhat strained. 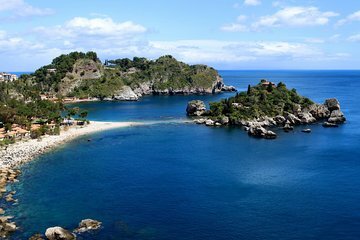 Taormina was spectacular and not to be missed.